Who would have thought that a remake of a 60’s science fiction series that had a less than favourable reboot in 2001 (thanks to Tim Burton), should become one of the finest trilogies of this century? That is exactly what has happened with Planet of the Apes, which started back in 2011 with Rise of the Planet of the Apes, continued with Dawn of the Planet of the Apes and now we have War for the Planet of the Apes, a film that is bleak, intense and incredibly moving, yet could easily be the best blockbuster of 2017. Yes, it’s that good. After renegade ape Koba started a war against the humans, Caesar has been trying to protect the rest of the apes from being wiped out, especially by a leader of troops only known as The Colonel. Caesar has always been against fighting but when tragedy strikes, he sees no alternative but to fight fire with fire and take his revenge. As he heads to where the army is based, he and his closest allies discover a human child who cannot speak and a former zoo monkey who calls himself Bad Ape. This ragtag band go into battle with a man who wants all apes wiped out. Whatever you do, don’t go into this 2 hour and 20 monster expecting explosions and action, fast cuts and constantly moving camera work. This is a blockbuster for those who like their films leisurely and intelligent. It relies more on the spoken word than any action. Yes, there are some impressive set pieces but unlike something that Michael Bay would make, director Matt Reeves allows his characters to talk, helping with character development and a deeper understanding of why this is happening and that is happening. We get long scenes where dialogue is just as important as the visuals. Even the villain of the piece, The Colonel, is allowed space for us to better understand why he has taken upon himself to lead this war. It’s not a moment of madness from a megalomaniac but an actual sense of humanity from a man who cold-bloodily shoots apes. The whole tone is beautifully managed. This was never going to be a happy charmer of a film. War is hell and doesn’t you forget it. Even if it’s a war between man and beast, it still rips loved ones away, causes mental anguish and violence breeds violence. Thankfully, there is light relief from a new character, Bad Ape, a chimp who escaped from a zoo and now is terrified of everything. He provides some welcome laughs in a film otherwise riddled with sadness. Once again the body capture images of the apes are extraordinary. So good are they that you forget they are CGI. The attention to detail and the way they move and interact is beyond anything you have seen and since the first film, the process seems to have got better and better. Along with that are the performances. Why hasn’t someone given Andy Serkis an award? His Ceasar has become an icon of modern cinema. A towering character who dominates even when he is not on screen. This time around, his voice has become more prominent and full sentences are forming, allowing Serkis to really develop a character who has already grown over the past two movies. Woody Harrelson is perfect as the Colonel, a man riddled with hatred and yet has a reason behind it. Harrelson always seems to deliver in these kinds of roles and once again, he is on top form. A new addition to the group, Steve Zahn, as Bad Ape, is a welcome face and he brings out an air of fun in a film that doesn’t have much room to be light. You could possibly see a Bad Ape spin-off. 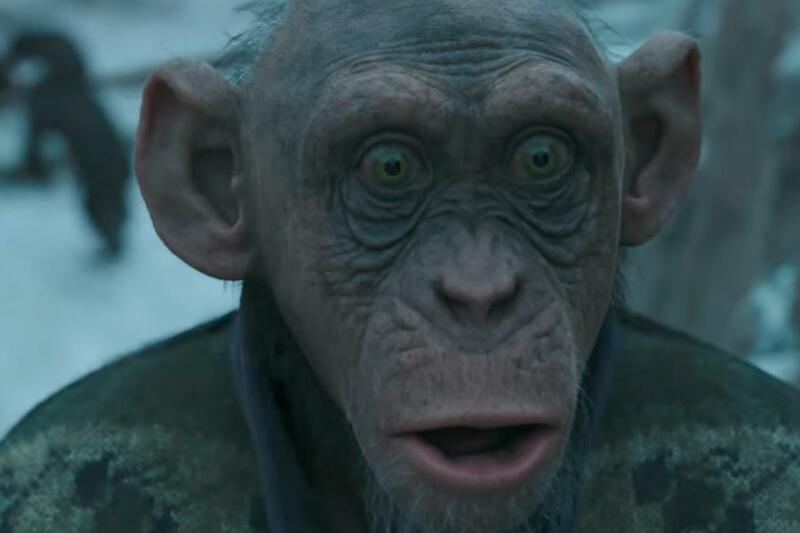 War for the Planet of the Apes is a triumph. A third film that rises above expectations and delivers everything you want from a series that, so far, has been outstanding. It might be too slow for the audiences looking for cheap thrills and sugar-coated eye candy. Those who are fans will come out fully satisfied. And to show you how confident it is in itself, he doesn’t end with a band but rips at the heartstrings. Fantastic.